This year is Thermaltake's 20th anniversary and the firm has made quite a broad range of exciting product announcements to mark the occasion - many appropriately given the 'Level 20' sub-branding. 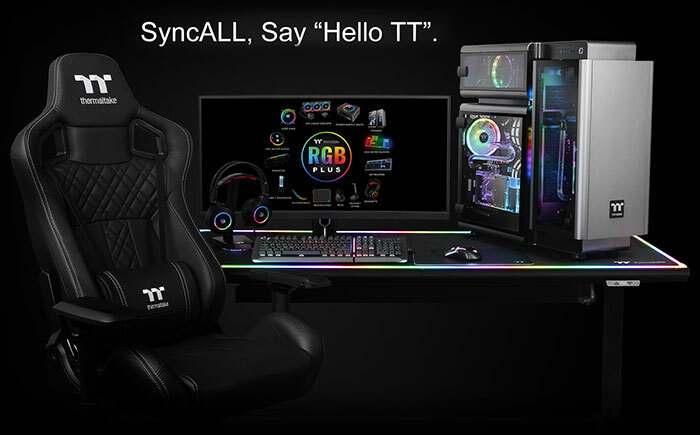 It is probably safe to say that Thermaltake's new products don't shy away from the use of RGB LEDs and below we share our audience experience with Thermal Mike (Mike Fierheller), as he talks us through the firm's dazzling product highlights. Thermaltake's Mike Fierheller and his product highlights. Thermaltake has officially entered the memory market. 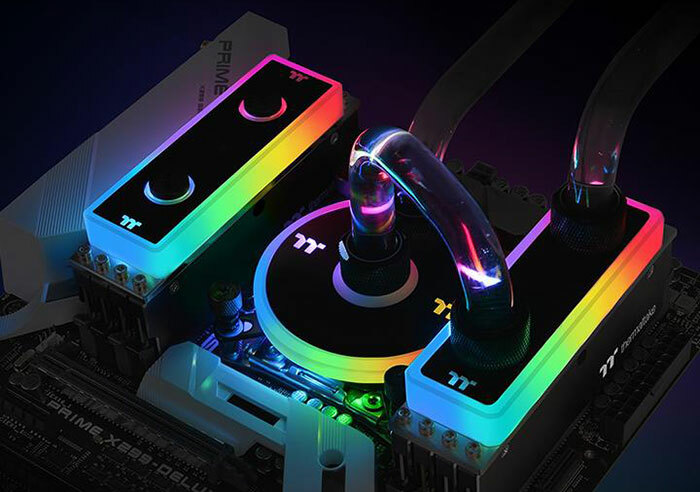 That alone may be worth a headline but on its 20th anniversary Thermaltake has presented the descriptively named WaterRam RGB Liquid Cooling DDR4 3200MHz 32GB/16GB memory kits. Rather than individually lit up DIMMs, as we have seem from other players, these water block cooled kits sit beneath a liquid cooled RGB construction. Each module has its own 2mm thick aluminium heatsink but the water block can reduce temperatures by 37 per cent and adds some RGB style. 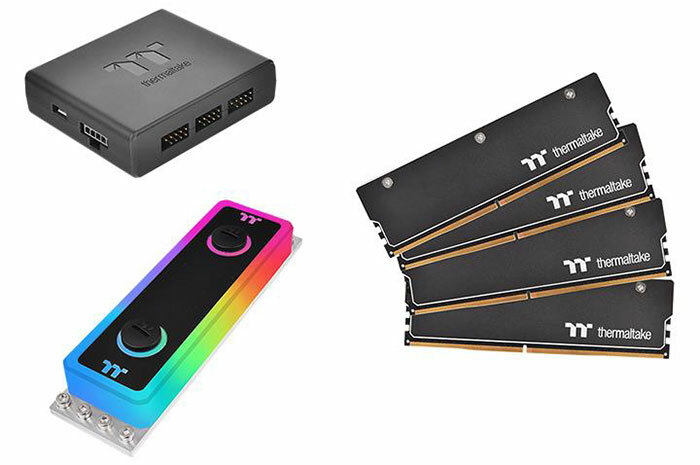 The Thermaltake WaterRam RGB 32GB kit is listed for sale right now (at $439.99) and in the specs we learn that it uses 3200MHz, CL16, Hynix C-die memory chips and is Intel XMP 2.0 ready. The 16.8m colour RGB functionality is nicely flexible and can be synced with T RGB PLUS software, TT AI Voice Control, Amazon Alexa, and Razer Chroma ecosystems. Moving along, Thermaltake is proud to announce some new gaming desks as part of its Level 20 range. There are two new gaming desks, with the top end model being the Level 20 RGB BattleStation Gaming Desk. These pieces of gaming furniture are constructed with thick and durable steel frames, anti-scratch surfaces with full cover mouse pad surfaces, and are fully height adjustable (from approx 28 to 41 inches). Cable management is also a standard feature. The differences are that the RGB model is height adjustable using built in motors (with four height memory positions) and includes 20 customizable RGB lighting zones which can sync with TT RGB PLUS Software, Razor Chroma, and Amazon Alexa Voice Service - in concert with your RGB case fans, CPU/VGA waterblocks, AIO CPU coolers, PSUs, LED strips, gaming keyboards, headsets, mice and mouse pads etc. It is demonstrated in our video. The Thermaltake Level 20 GT BattleStation Gaming Desk has a suggested price of $399.99 but the Level 20 RGB Battlestation Gaming Desk is quite a bit more expensive at $1099.99. 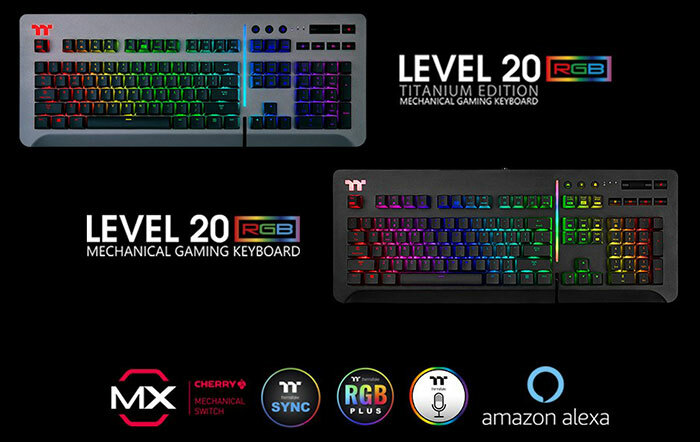 Thermaltake's Level 20 RGB gaming keyboard will be made available in a titanium grey or black finish and is constructed with a premium aluminium top plate and floating keycap design. Yes, these are again RGB infused devices and include 13 dynamic lighting effects (front-side) and 14 dynamic lighting effects (side-face) as well as backlighting of the keys. Syncing with other TT peripherals and Razer Synapse 3 devices is available. Keyswitch choice ranges from Cherry MX Speed Silver or Blue, to Razer Green. Users will be happy to know there are convenient volume/mute and multimedia controls too. Both audio and USB pass through ports are located at the back of the keyboards. Depending upon your keycap choice the Level 20 RGB gaming keyboard costs $129 and up. Samsung intros HBM2E for data centres, graphics, and AI DRAM price decline will slow in Q2 says Nanya Technologies QOTW: Who makes the best PSUs? QOTW: Who makes the best PC chassis? QOTW: Who makes the best CPU coolers? just me who thinks they missed a trick by not connecting the motorised height adjust to Alexa commands? Not until they finally figure out how to implement and market it in stylish ways, rather than garish ones with lit logos and leaving it stuck in rainbow pattern Demo mode…. Seriously, why don't they just hire me for their design department? An RGB desk, because we all needed that in our life. Why? It emits light in an indeterminate quantum state for 30 seconds. Then it gets tired and falls asleep.